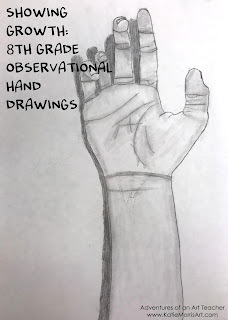 For one of my growth measures this year, I decided to focus on observational drawing skills with my 8th graders. First, I asked the students to draw their hand without any other instruction. This served as the pre-assessment. The next couple of class periods were spent on drawing skill builders like continuous line drawings, blind contour drawings, and even drawing with the non-dominant hand to try to get students to slow down and look closely. After the practice and a few pep talks given to my class about how art is a skill that CAN be learned, I demonstrated drawing my own hand from observation, sharing some tips on measuring and comparing proportions, and later demonstrated shading, before the students started the post-assessment of drawing their hand from observation applying what they'd learned. I used a simple rubric to score the pre and post assessment drawings so that I could give numerical evidence of growth. It's so easy for us to see improvement but administrators tend to like numbers. The document I turned in had a section about why observational drawing is important, and explained the process from pre-assessment, instruction, post-assessment, and then the evidence. I included a graph and a chart with scores before and after as well as percentage of growth. Even though numbers proved the growth, I still included some side by side photographs at the bottom of the document, which my principal said he appreciates seeing. Here is a copy of the document I turned in, except with student names covered and replaced. Importance: Observational drawing is a foundational skill for many art media and processes and the benefits from the studio habit of “observation” carry over into many non-art activities and vocations. 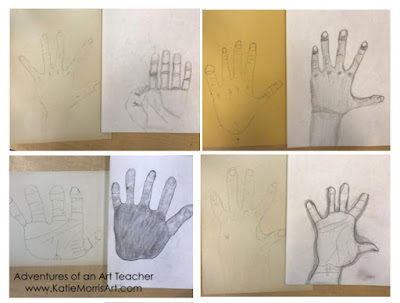 Hands are one of the parts of the figure that students tend to avoid or struggle to draw so instruction in it now will help students feel more comfortable with the task in their future work. Pre-Assessment: The students were asked to observe and draw their own hand without any prior instruction. The work was assessed with the following rubric. Scale: The proportions are correct- the sizes of parts of the hand are correct when compared to other parts. Observation: The hand is drawn accurately and attention was paid to details. Craftsmanship: It is evident the student put care into the work to make it as good as it can be. 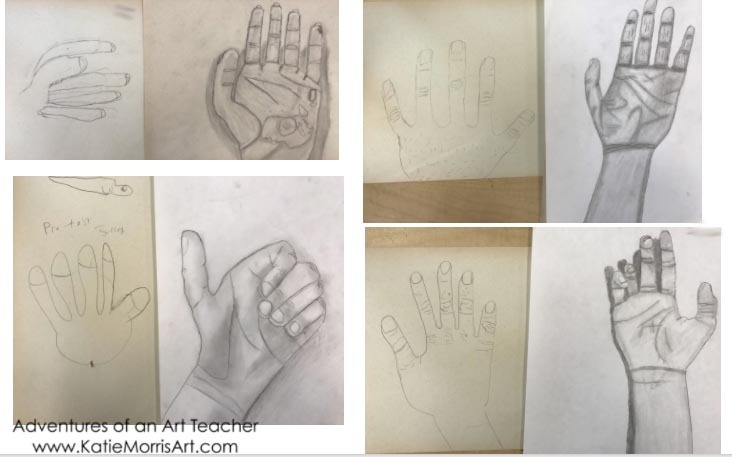 Teaching: After the pre-assessment, the students practiced drawing hands with a continuous line drawing, a blind contour drawing, and drawing with their non-dominant hand, all activities which are supposed to help the artist slow down and look carefully. 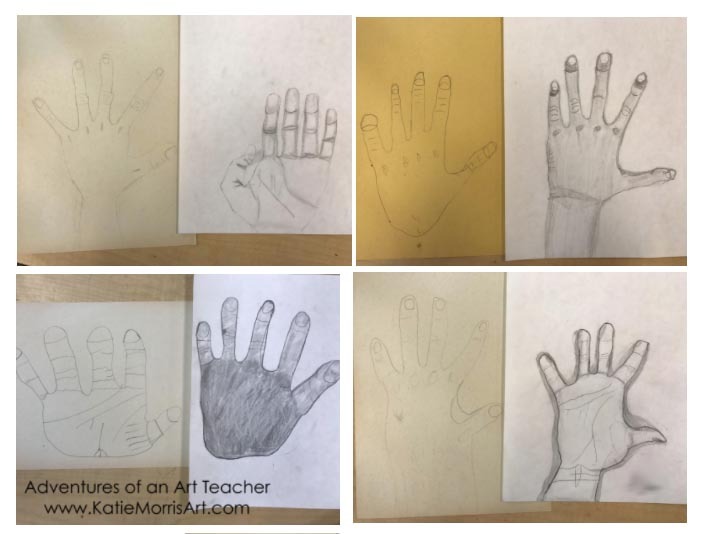 Next, the teacher demonstrated drawing her hand, shared tips for dealing with parts of the hand, and talked about proportions and measurement tools. Post-Assessment: The students were asked to again observe and draw their own hand applying what was demonstrated. The work was assessed with the same rubric.